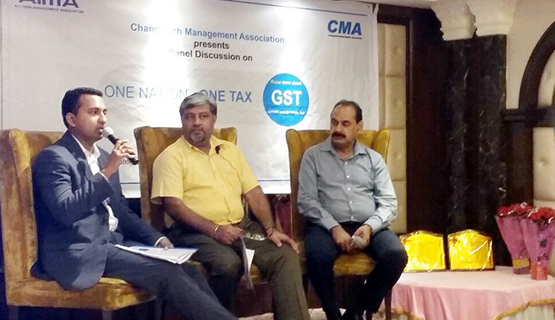 Chandigarh Management Association (CMA) organised a panel discussion on “One Nation – One Tax – Know more about GST” on 15 July 2017 (5:30 PM) at The First Hotel, Sector 43 Chandigarh. Two top Chartered Accountants of the city Mr. Uma Kant Mehta and Mr. Vaibhav Garg were the panellists. Mr. Deepak Kumar Dhingra, President CMA moderated the panel discussion. Mr. Hitesh Kumar Gulati, Secretary General, CMA conducted the function very smoothly. More than 70 members attended the event and the hall was jam packed. There was so much to be asked that the volley of questions from the audience started even before the panel discussion could began. The one hour session was full of questions and befitting replies of the learned panellists. It was indeed an enlightening session.